Welcome back! Some readers are unable to access my Kindle e-book as Amazon isn’t available in their countries. So I’ve re-published another edition under Smashwords. The Smashwords edition can be read on the Kindle reader relevant to your mobile device or PC which can be downloaded free. If you are using the Kindle reader, click on the "mobi (Kindle)" button to preview or purchase. Alternatively, readers can download the Adobe Digital Editions e-reader for free. This e-reader is common to all mobile devices and PCs. In this case click on the "ePUB" button to preview or purchase. Thank you for the feedback and happy reading! 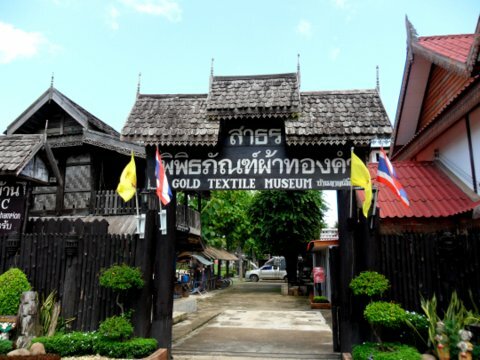 This is our last stop in Sukhothai and we visit another very special museum in Si Satchanalai that displays some very old textiles some of which are more 100 years old. 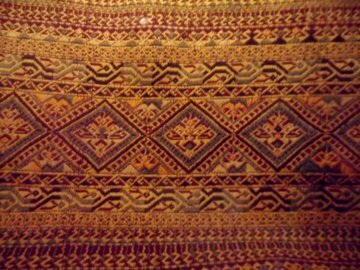 The Sathorn Gold Textile Museum was started in 1988 by Sathorn Sorajprasobsant in Tambon Baan Had Siew, Si Satchanalai district, Sukhothai. 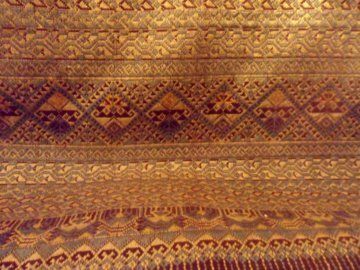 Khun Sathorn deals in these gold textiles woven by the Thai Puan community in Baan Had Siew and the surrounding area. He decided to open a museum to preserve these works of art which range from 60 – 200 years old. 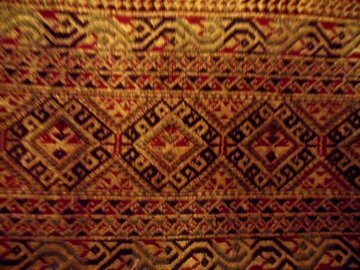 He has won several awards for his craftsmanship including OTOP (One Tambon One Product) and royal awards. 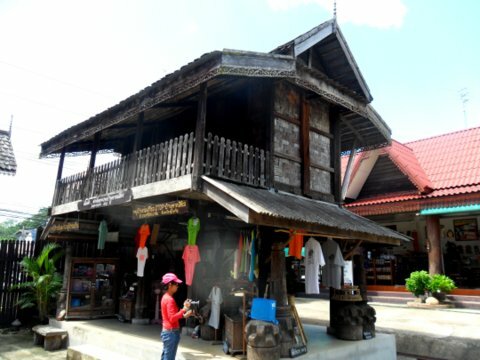 Besides a shop selling textiles just next to the museum, there is also a cultural village within the grounds. 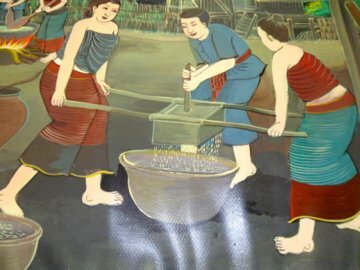 The Thai Phuan are an ethnic group that originated from Xieng Khouang province in Laos. 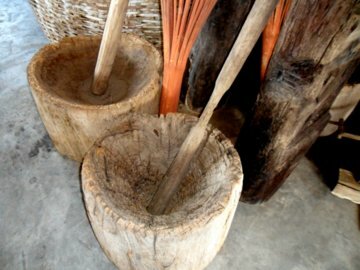 Xieng Khouang province is on a plateau where the famous Plain of Jars is located. This area with its huge pre-historic burial jars was heavily bombed by the USA during the Vietnam War. 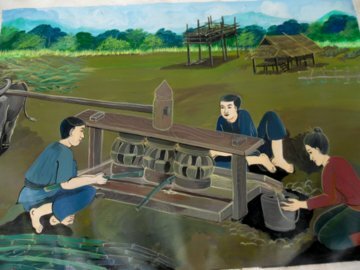 Many of the Thai Phuan have migrated to Thailand as early as 200 years ago and settled in the north, north-east and central regions of Thailand scattered around 19 provinces in Thailand. 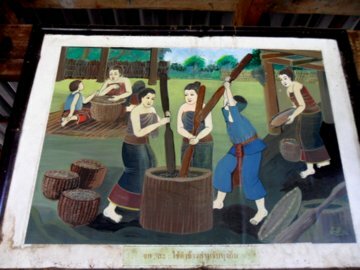 The biggest concentration of Thai Phuan is in Lopburi about 150 km north of Bangkok. 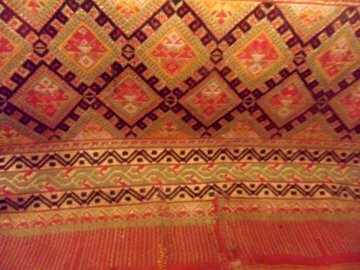 The Thai Phuan are famous for their beautiful hand woven textiles, Pa Sin Tean Jok and we will be viewing some of these textiles with their ageless beauty in the next section. 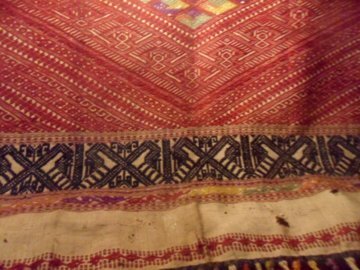 Here are some of the old textiles on display in the museum. 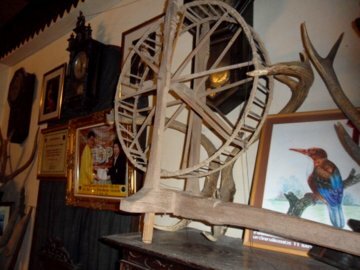 Many of these old pieces were donated by members of the community. During the courting period, a young man must be ordained as a monk. 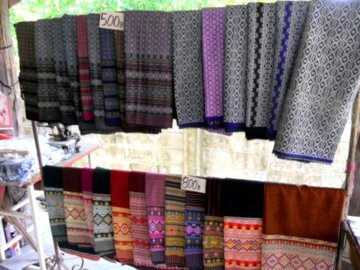 His bride-to-be will prepare a set of five different types of special fabrics for the ordination ceremony. The Pa Gung is one of them. 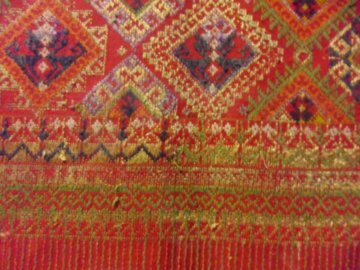 The next piece of textile was a surprise. 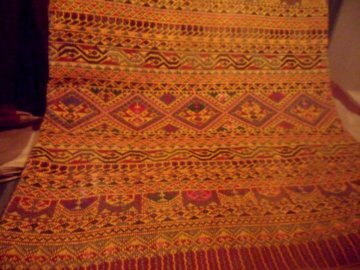 It’s donated by a resident from Koh Samui, Surat Thani in southern Thailand, who acquired the fabric from Bali, Indonesia. 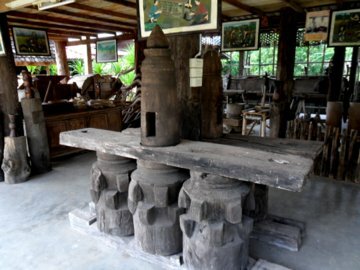 Here are four pieces from Uttaradit, a province just north of Sukhothai. 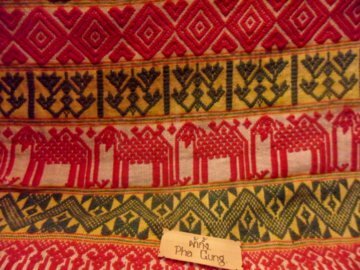 The next few photos feature the Pa Sin Tean Jok fabric for which Tai Phuan are famous. 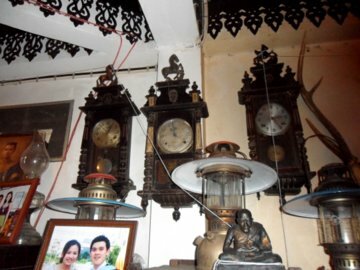 These are more than 200 years old and were donated by the various people from Thai Phuan communities in Si Satchanalai. 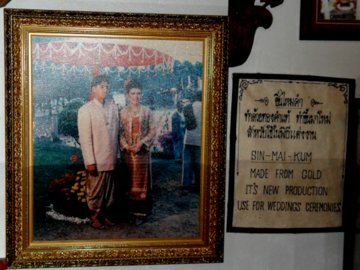 Khun Sathorn pointed out with pride the wedding photo of his son. 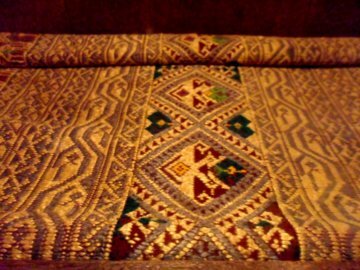 The fabric for the wedding dress worn by the bride was woven with gold thread made from gold equivalent to the weight of 82 one baht coins. It is customary for unmarried women or brides to wear read skirts and married women to wear black. 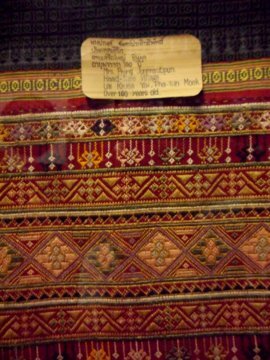 At the price of gold in 1992, the dress cost 382,000 baht! Imagine what it will cost at today’s gold prices. 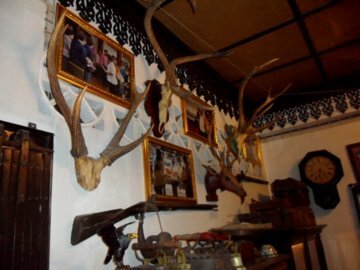 The Sathorn Gold Textile Museum also has some interesting and old displays are found on the walls and the sides of the room. 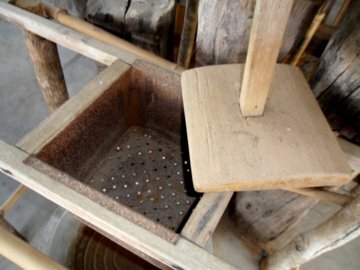 The cultural village within the grounds of the museum is modelled after a Thai Phuan village and preserves their farming equipment used in the old days. With the help of the picture illustrations, I managed to figure out what some of these utensils were for. 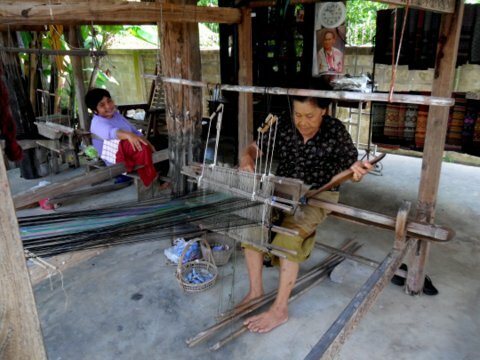 In the empty space below another house, two ladies work steadily on hand looms. 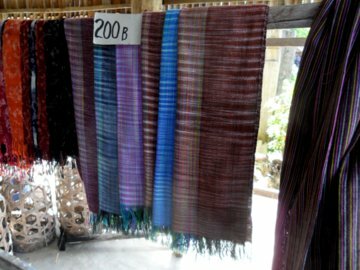 These beautiful textiles woven by them are on sale. 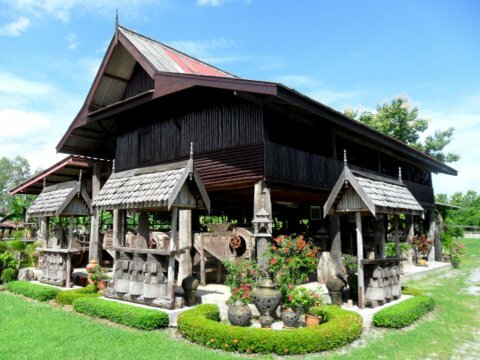 With this visit to a special museum set up by a dedicated individual, we end our tour of Sukhothai province. There are many such museums like this all over the country that feature special works of art that we may not have thought about. 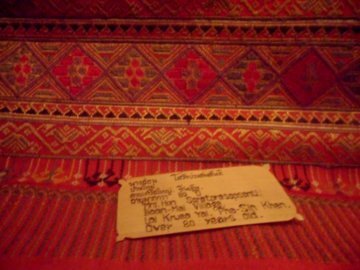 My thanks to Khun Sathorn Sorajprasobsant for sharing this experience with us. 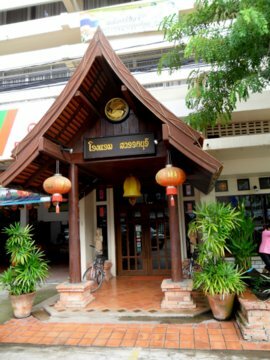 Take a tour bus from Mor Chit the northern bus station in Bangkok to Si Satchanalai. Fare is 409 baht. Do not take the bus to Sukhothai city as it terminates at the city bus terminal. For accommodation, this beautiful hotel in Sawankhalok came highly recommended. 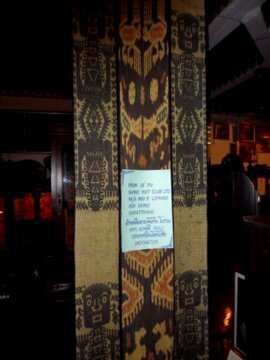 I stayed at the Sawankaburi Boutique Hotel for 800 baht per night. The rooms are comfortably furnished with traditional Thai décor of wood paintings and ceramics. There is very little public transport available. So make arrangements with hotel where you are staying for car rental services. I am grateful to Lumpoo Pramchit for showing me the historical and cultural sites in her home province of Sukhothai. We explore Bang Pakong, the Dragon River, Chacheongsao.